1) Decorate an envelope or package . Size is senders choice in a spring theme( flowers, butterflies, rainbows etc.) Please put some artists love into it. You could use stickers, washi tape, mixed media, etc.Please use tape or whatever you want to secure the art well. And put effort into this part. 2) add ONE handmade item of your choosing that is a spring theme. Please put time into creating. I think you get the idea just include something handmade by you with a decent amount of love put into it and it must be in a spring theme. Etc. Any spring related flat gift. Senders choice. 4) Please include a note on a pretty note card(open face or folding), or on pretty stationery paper. 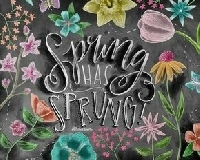 The note can be a spring poem, a nice note to them or a spring quote. Please include your swap bot ID and swap name. 5)Send on time. And Please make sure to secure your envelopes or packages. And always use enough postage. 6) Please rate 5 if you receive a spring themed envelope, a handmade item, a flat gift and and note. (Art is subjective) If it is extra special please give a heart.